Why DidnÂt I Think of That? Never lose your drink again. 3 million cups sold to date partiers are saving time and money with less abanonded drinks. California Surfer Saves Lives with Etch-it Party Cup Invention. California surfer Michael Marrin is starting to see the green with his patented invention. Now partygoers donÂt have to worry about misplacing their cup and spreading germsÂ all they have to do is use Etch-IT Party Cups! 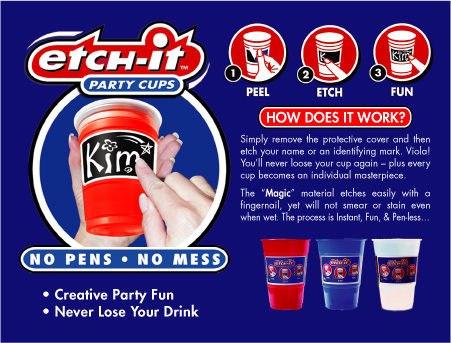 Etch-it party cups are instant, fun and pen-less. To use, simply peel the cover then etch your name or cool design. Viola! Every cup becomes an individual master piece & the user will never lose their drink again. The specially formulated Âmagic waxÂ coating on every etch-it party cup name tag is guaranteed not to smear or stain like when writing on cups with marking pens. With Etch-it Party Cups Partiers will liven up an event by etching pictures or catchy slogans such as ÂHi. IÂm single.Â ÂTake Me HomeÂ etc. Party Host report they save money and have less to clean up because of fewer abandoned drinks. Marrin's innovation hit the retail shelves of party, liquor and internet stores around 24 months ago. Over 3 million cups have been sold to date. In the cup world thatÂs a small number but as people become "Etch-U-Cated" the demand is dramatically increasing. Available in RED, BLUE & FROST, Etch-It Party Cups retail from 15-22 cents each. Future plans for MarrinÂs company Upardi Inc are to adapt the patented etch-it equipped technology to bottled waters and sport drinks. Just think about those concerned soccer moms when their child athlete runs on and off the field to re-hydrate. They recognize the need to identify a bottled beverage in a hurry. A sport drink or bottled water equipped with the etch-it I.D system is instant, fun and will not smear or wash off in an ice chest. In theory as etch-it becomes more popular the product will save someoneÂs life by preventing the spread of germs. Who knows with over 3 million cups sold a life may have already been saved. Upardi Inc. is a consumer products company based in Orange County, California dedicated to understanding what consumers want and incorporating those needs into the design and development of new products and technologies. Currently Upardi Inc. markets & develops products under the brands of Etch-it party cups and Etch-it Equipped. For more information, and store locations visit http://www.etch-it.com or call (949) 425-0799.